This recipe was passed down from my Great Grandmother on my Mom’s side. I credit this recipe to my Mom because a few years ago, she made a key adaptation to a previously unchanged recipe that made it truly GREAT. I was never a stuffing person growing up; I found it gummy, flavorless and, most of all, full of raisins (which I strongly dislike). A few years back, my Mom switched out the raisins for craisins (dried cranberries) and I am now a huge fan of this dish. *If you are using raisins, plump them before adding them to the mix. To do this, pour boiling water over raisins until they are covered. This should puff them right up. 1. Remove crusts from bread and toast lightly on both sides. If you have stale or day old bread, it is better so buy this ingredient ahead of time if you can. 2. Chop onion and saute until golden brown in about 3 tbsp. of butter. When onions are golden brown, add chopped celery and cook slightly. 3. In another skillet, break up the pork sausage and cook until almost done. Start with a cold skillet and drain grease as it accumulated. You don’t want to add the grease to the stuffing mix. 4. In a large bowl, break up the toasted bread into about six pieces per slice (you don’t want it too small as you don’t want mushy stuffing). 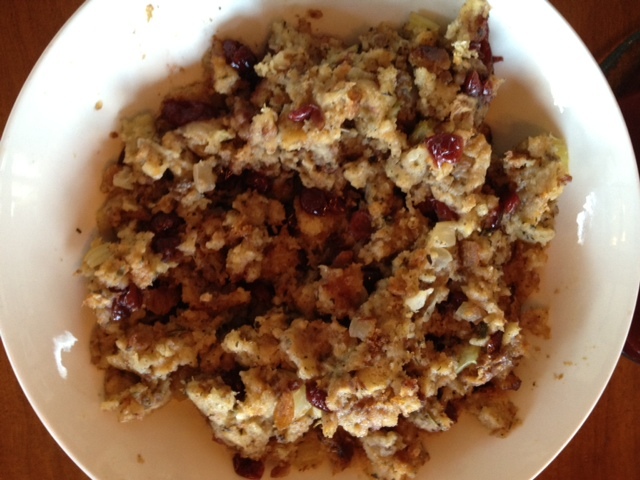 Pour the onion and celery mixture over this and then add the pork sausage, craisins (or raisins) and beaten egg. Mix lightly. 5. Add small amount of broth to moisten (not too much as it will get juices from the turkey as it cooks). Then add salt, pepper, poultry seasoning and sage, to taste. Don’t forget the stuffing is going to cook inside your seasoned bird and will absorb many of the turkey’s flavors. Go lighter rather than heavier on the seasoning and broth here. 6. Stuff the neck of the bird and close it with a skewer. Then flip the bird over and stuff the other side; cover with a thick slice of bread (you will discard this piece of bread, it is just to prevent the stuffing from burning or absorbing too much of the turkey baste). Don’t overfill either opening as the stuffing will swell in baking. 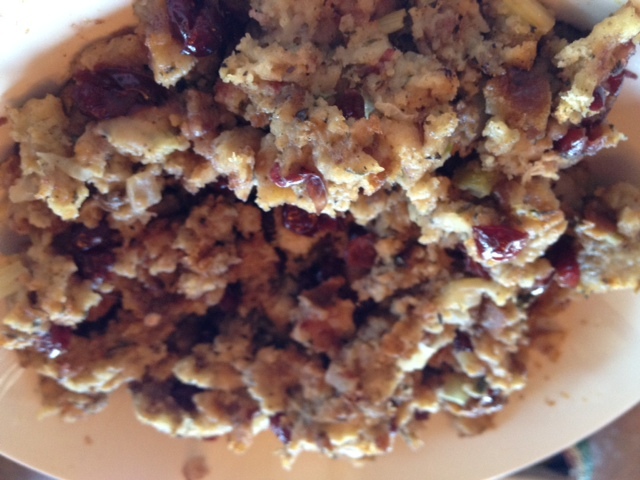 If there is any extra stuffing, you can bake this separately at 350 degrees for 30-45 minutes, until brown and warm. 7. Cook turkey according to directions on Thanksgiving Dinner: Grandma’s Turkey recipe. When turkey is removed from oven, remove stuffing and put in a serving dish. Serve immediately.